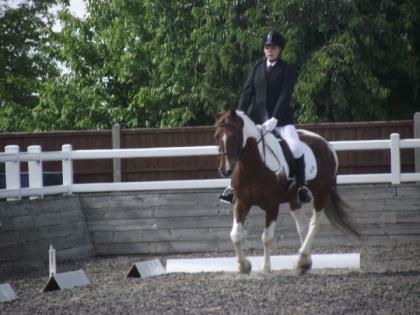 A very warm welcome to Witham Villa, Leicestershire’s Premier Equestrian Centre. Our Premier Equestrian Centre is situated in the heart of the Leicestershire countryside but close to all main road networks and has provided excellent horse riding lessons and services to all our customers since 1992 and we endeavour to improve continuously. As a busy riding school we teach progressive horse riding lessons to all our clients. We are British Horse Society, Association of British Riding Schools & Council Approved 5* Riding Establishment and a BHS Where to Train Approved centre to BHS CCH. In our 2014 Where to Train Inspection Report the general comments were: "All the horses were in very good condition, the centre is very neat and tidy which helps give a very good impression of the high level of horse care and teaching" In addition, the inspector commented that he felt the centre would make a very good stage Four training centre due to the high quality horses and training available. Animal Activity License Holder: Verity Saul Licence No AW003 . Witham Villa is proud to have achieved the highest rating possible of 5* from the local authority inspection. We are a Pony Club Centre and British Riding Club Centre enabling non horse or pony owning riders to become part of these national organisations and work to improve their skills. We welcome riders of all ages (minimum age 4 years) and abilities to our stables and look forward to seeing you at Witham Villa joining in one of our riding lessons. The rider weight limit for our horses to carry is 14 stone. Check out our comprehensive summer programme for all new and existing riders including 2 weeks of Pony Club Junior camp - 2 weeks of Pony Club Camp and 1 week of Senior Pony Club Camp. These are non residential. Horse riding is a fun and enjoyable sport - come along and have a go. Special offers for all new riders free hat and boot hire for the 1st lesson. We teach all abilities from the age of 4 upwards either on an individual, semi-private or class lesson basis for half hour or one hour sessions. All lessons are taught by suitable trained instructors. Here we give some broad information about our staff at Witham Villa and talk about qualifications and any other brief background information. Meet our horses in The Witham Gallery and here is some text to explain why they are so good and the different types that you can learn and ride upon eg show jumping, dressage and so on. Find out more about our special and forthcoming events and shows which occur throughout the year and get the latest results as they happen. To get the best results you need the best trainers…and we have them at Witham Villa. Visiting National and International trainers for show jumping, XC and dressage clinics. Our investment in the best quality facilities means you can train and ride in any weather, indoors or outdoors. We are British Horse Society, Association of British Riding Schools & Council Approved Riding Establishment and a BHS Where to Train Approved centre to BHS AI. In our 2014 Where to Train Inspection Report the general comments were: "All the horses were in very good condition, the centre is very neat and tidy which helps give a very good impression of the high level of horse care and teaching" In addition, the inspector commented that he felt the centre would make a very good stage Four training centre due to the high quality horses and training available. We can add captions to these pictures if required. All facilities are available for hire. Loads of show jumping and dressage competitions plus fun activities during the school holidays! Check out our comprehensive summer programme for all new and existing riders including 2 weeks of Pony Club Junior camp - 2 weeks of Pony Club Camp and 1 week of Senior Pony Club Camp. Check out our Facebook feed…live!